Stella Liu (International Studies ’15) likes to think outside of the box, which has defined her way of doing things since her time as a Campuswide Honors Program student. Her career trajectory started with an IoT ag-start up company OneSeed, which she founded while at UCI. This idea sprouted from her interests in food security. It was a sign of bigger things to come, as Stella’s career has been defined by entrepreneurship, particularly working across disciplines and sectors. 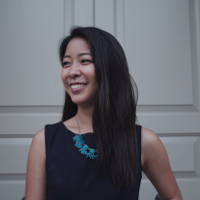 After graduating from UCI, Stella went to work for IBM in their Watson Internet of Things Division, where she found that she could have an entrepreneurial experience within a large company. “My job is exciting—I get to work with cutting edge technologies like machine learning and artificial intelligence.” As an Advisory Product Manager she helps push through ideas like an entrepreneur, and feels that her startup experience has stood her in good stead. Taking a leave from work in 2016 she revisited her interest in food security as a Fulbright Research Scholar. Here again, ideas and disciplines came together in research and policy papers on how technology can help improve agricultural output in Asia. One of her policy commentaries, on the need for a second Green Revolution, was featured in New Straits Times, one of the largest newspapers in Malaysia. As for advice she would give to current CHP students who want to be engaged and make a difference in the world, Stella recommends the website https://80000hours.org/ which helps young people make career choices that help solve the world’s most pressing problems.